Uber has arrived. The smartphone-based car service officially launched in Burlington at noon today. Seven Days reported on Monday that the company was coming to town this week to sign up drivers and distribute phones to them. At the time, Uber spokeswoman Kaitlin Durkosh said the company was still doing "market research." Apparently, Uber was pleased with the results. The company has been advertising in the Burlington area for months. According to William Guernier, general manager for regional expansion at Uber, hundreds of people have signed up to be drivers and thousands have downloaded the app. Guernier declined to provide specific numbers. Several hours before the launch, Durkosh and Guernier met with Mayor Miro Weinberger. His chief of staff, Mike Kanarick, said the mayor requested the meeting after learning about the driver sign-ups. Both Uber and the mayor described the meeting as "productive." Uber has upset traditional taxi companies and clashed with regulators over the question of which laws apply to them. Queen City cabbies have written to the mayor and city council requesting that they ensure Uber is subject to Burlington's taxi ordinance, which requires drivers to get a license from the city, use meters to determine their rates and adhere to certain safety standards. 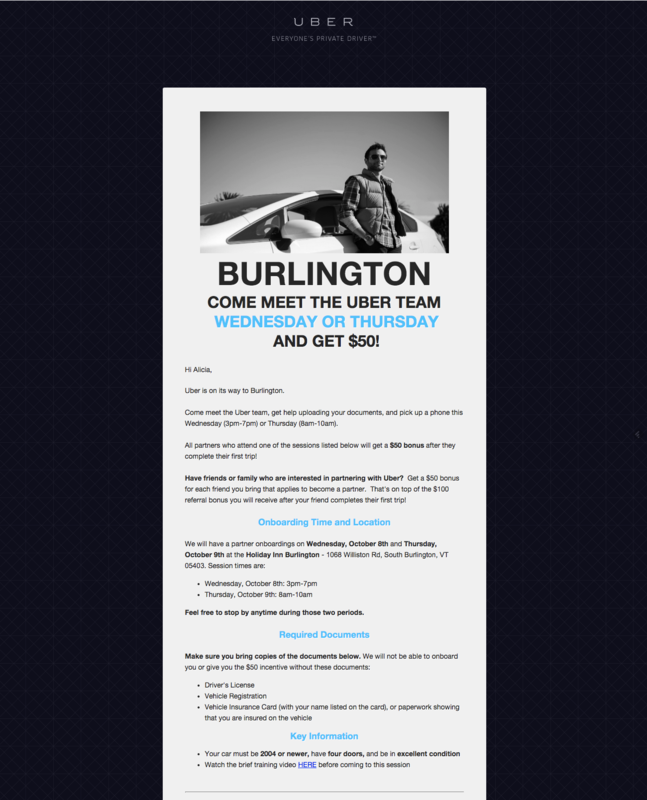 Burlington taxi regulators, currently based at the Burlington International Airport, have made similar requests. The city's current ordinance, which was overhauled in 2011, does not address smartphone-based car companies. In response, the city attorney's office began work on a memo — not yet complete — to address concerns. Now that Uber is here, it's hoping to have some say. "We'll be working with the mayor's office in the coming weeks to help start the discussion about what these new regulations should look like," Guernier said. In the first meeting, he said, "We helped educate them a little bit more about Uber and they are excited about new options for the people of Burlington." Guernier went on, "The mayor had some very good questions but I think he gets it. That this is additive to the transportation infrastructure in Burlington and it can only help people get around and it can only help local people earn a bit of extra money." Uber, which started in San Francisco in 2010, now operates in more than 200 cities worldwide. The model is simple: People open the app and hit a button to request a ride; their credit card is charged automatically after the driver drops them off. Multiple riders can split the fare. To become a driver, people need to pass a background check, participate in a training and submit their license, vehicle registration and insurance information to Uber. Cars have to be 2004 models or newer and have four doors. Uber provides up to $1 million in primary insurance to its drivers. Drivers are required to rate passengers; passengers have the option of doing the same for drivers.